Election day is still five months away but the political mudslinging marathon has already begun. The participants are not just the political candidates but also their staunchest supporters. The problem, however, is that very few of these mudslingers actually get the point. Despite being a Duterte supporter, I never feel offended by these attacks. I see these attacks as a political reality and an opportunity to learn more about my country and my people, that’s why I read them with unparalleled delight. Truth be told, I am not a die-hard Duterte fan. While some posts reflect my political leanings, the primary reason for this website is to encourage informed dialogue, regardless of your presidential preference. Who knows? I might even vote for your presidential candidate if you can successfully explain to me why I should. Judging from what I see on Facebook and Twitter, the supporters of presidential candidate Mayor Rodrigo Duterte are the favorite targets of other camps. Why not? Davao City Mayor Rodrigo Duterte zoomed to the top of all pre-election surveys after proclaiming his candidacy in November. He has a strong mass base, he’s got support from a large majority of Classes A,B, and C. Basically, at this moment, he really is the man to beat. Right now, sixty-two percent of Classes A, B, and C prefer Duterte. The other candidates are dealing with their own set of problems. Corruption allegations against Vice-president Jejomar Binay have consistently pulled his numbers down. Senator Grace Poe’s legal issues have caused more than just a dent on her popularity. Meanwhile, former Interior Secretary Mar Roxas, has always had dismal numbers. Lastly, Senator Miriam Defensor-Santiago, plagued by health issues, has the temerity to believe that an online campaign is enough to win the presidency. Many believe that Duterte’s major issues – the extrajudicial killings of hardened criminals, the swearing, and the womanizing – are potent weapons to dissuade the people from voting for him. All these anti-Duterte groups seem to imply that only idiots will vote for someone like Rody Duterte. From Amnesty International to Rep. Walden Bello, condemnations of alleged human rights violations are plenty. Meanwhile ABS-CBN and the Philippine Daily Inquirer makes sure that every swear word that comes from Duterte’s potty-mouth is milked in aeternum. After all, Korina Sanchez-Roxas is ABS-CBN’s own, while the Prietos of the Inquirer are related by marriage to the Aranetas, where Mar Araneta-Roxas belongs. Those already on the Duterte boat are loyal to the man, despite the flaws. The same people believe Duterte’s strengths far outweigh his flaws. That most poor people from the countryside – the bulk of the masses – walk like him, talk like him, and act like him. His demeanor is no big deal for them. That is, those who hate womanizers, potty-mouths, and vigilantes, are already convinced that they shouldn’t vote for Duterte. I mean, just look at you. On the other hand, those who already support Duterte couldn’t care less about it. In short, strategies banking on these three issues simply will not work. Remember that political campaigns aim to convince supporters of another camp to change their mind and vote for another. With that said, you can't convince anyone if the first thing you do is call that person an idiot in his face. He may really be an idiot, but he's still an idiot who will vote for Duterte. Extrajudicial killing is morally wrong but Duterte supporters accept that it may be a necessary evil, so there’s no point in hammering that. Cussing and womanizing are morally wrong too, but Duterte supporters feel that it’s a lesser evil compared to the flaws of other candidates: Binay’s greed, Mar’s elitism, Poe’s disloyalty, and Miriam’s frailty. Now, I am not saying that these other four candidates indeed have those flaws. However, the fact is that it’s how the Duterte-supporting public sees them, and in the context of the 2016 elections, it's their opinion that counts. In reality, political campaigns are games of influencing public perception. We can argue all day about who accomplished what and who graduated from where. But at the end of the day, it’s what the public perceives that really matter. 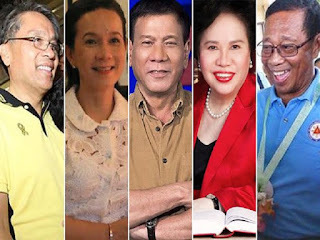 Worse, Duterte supporters may interpret incessant personal attacks on Duterte as a direct threat to their own belief systems, causing greater social cohesion within members of the pro-Duterte crowd, and this is the last thing that a Roxas, Santiago, Binay, or Poe supporter would want. Why? Because the solid 38% majority that supports Duterte right now is enough to make him the 16th Philippine President. So what should you, as an anti-Duterte campaigner, do? Use a new and different angle of attack if you still with to bank on the three issue. If you'll if you can't find that angle, find another issue. Hit sparingly, but hit hard. Stop the personal attacks. Yes, many Duterte supporters will still continue with personal attacks against Mar and the other. But then, remember that achieving universal fairness is not your objective. Instead, it's to get their votes. Why? Because at the rate things are going, it appears that the next president's last name may start with the letter "D".